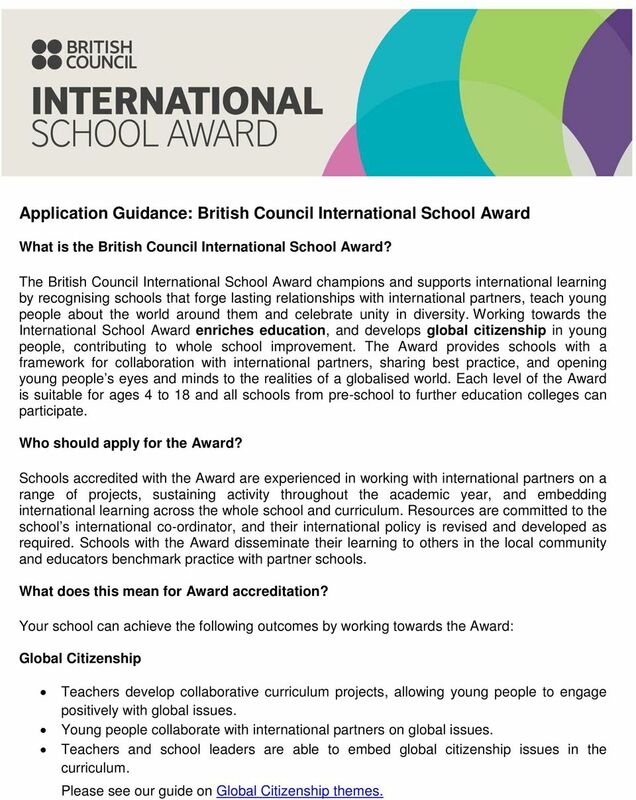 Download "Application Guidance: British Council International School Award"
1 Application Guidance: British Council International School Award What is the British Council International School Award? 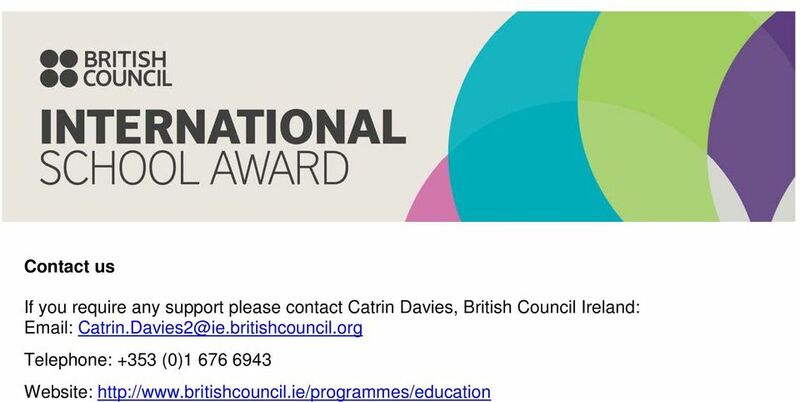 The British Council International School Award champions and supports international learning by recognising schools that forge lasting relationships with international partners, teach young people about the world around them and celebrate unity in diversity. Working towards the International School Award enriches education, and develops global citizenship in young people, contributing to whole school improvement. The Award provides schools with a framework for collaboration with international partners, sharing best practice, and opening young people s eyes and minds to the realities of a globalised world. Each level of the Award is suitable for ages 4 to 18 and all schools from pre-school to further education colleges can participate. Who should apply for the Award? Schools accredited with the Award are experienced in working with international partners on a range of projects, sustaining activity throughout the academic year, and embedding international learning across the whole school and curriculum. Resources are committed to the school s international co-ordinator, and their international policy is revised and developed as required. Schools with the Award disseminate their learning to others in the local community and educators benchmark practice with partner schools. What does this mean for Award accreditation? 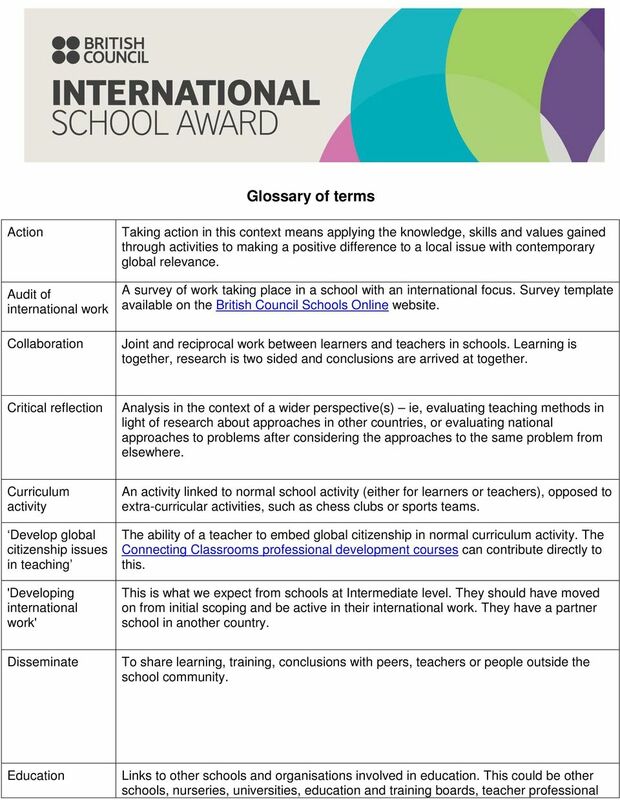 Your school can achieve the following outcomes by working towards the Award: Global Citizenship Teachers develop collaborative curriculum projects, allowing young people to engage positively with global issues. Young people collaborate with international partners on global issues. Teachers and school leaders are able to embed global citizenship issues in the curriculum. Please see our guide on Global Citizenship themes. 2 Enriching Education Teachers from different countries work collaboratively to adapt successful practices, implementing them in their own educational contexts. Schools can find Global learning resources and professional development opportunities on the British Council Schools Online website. How does ISA relate to the Ireland curriculum? The International School Award supports Irish schools/colleges to: Enhance the quality of education (curriculum and teaching) Improve pupils life skills and levels of achievement and learning Increase leadership, teamwork and collaboration with 3 rd parties locally and globally Embed Global Citizenship within the curriculum development and intercultural education, as well as economic awareness and sustainability in a global economy Effectively measure key academic and respond to international benchmarks such as the PISA 2015 survey. 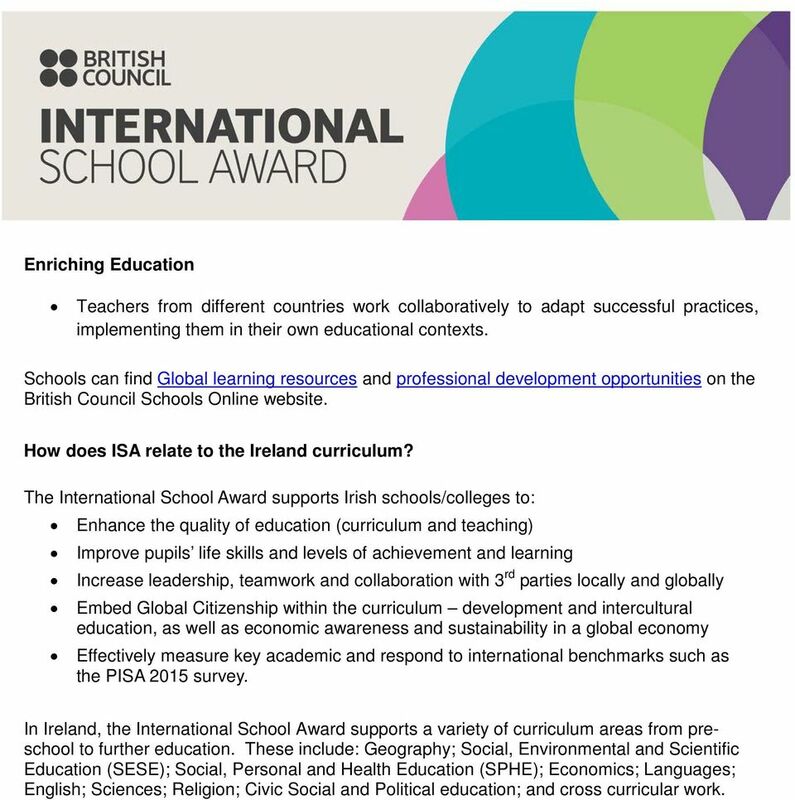 In Ireland, the International School Award supports a variety of curriculum areas from preschool to further education. These include: Geography; Social, Environmental and Scientific Education (SESE); Social, Personal and Health Education (SPHE); Economics; Languages; English; Sciences; Religion; Civic Social and Political education; and cross curricular work. 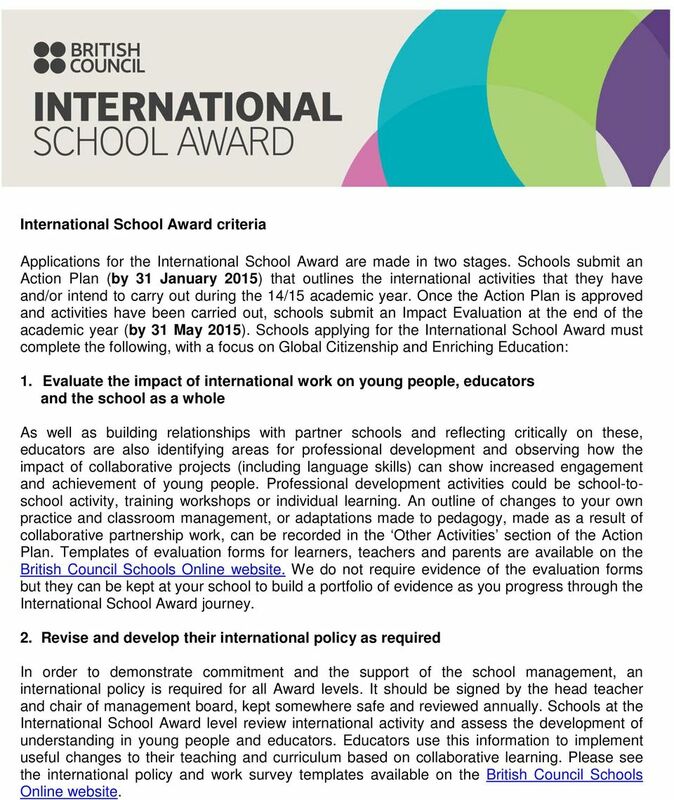 3 International School Award criteria Applications for the International School Award are made in two stages. Schools submit an Action Plan (by 31 January 2015) that outlines the international activities that they have and/or intend to carry out during the 14/15 academic year. 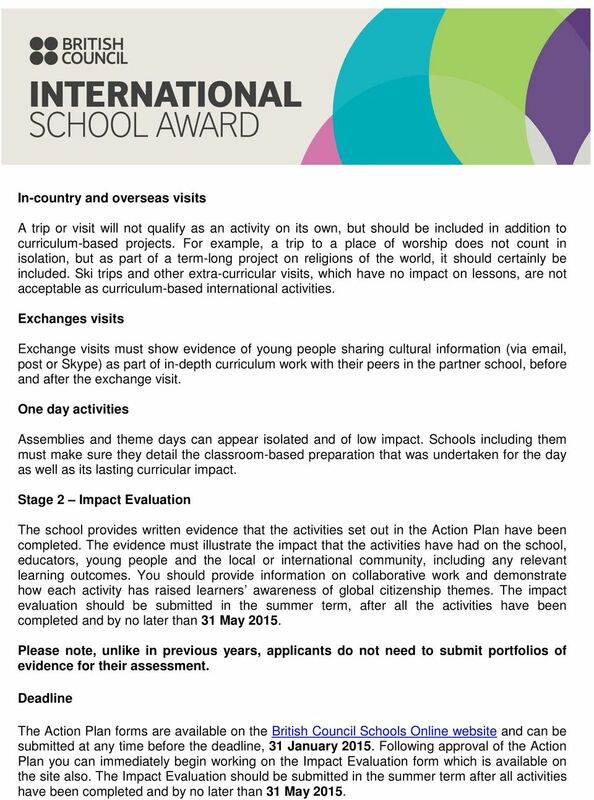 Once the Action Plan is approved and activities have been carried out, schools submit an Impact Evaluation at the end of the academic year (by 31 May 2015). 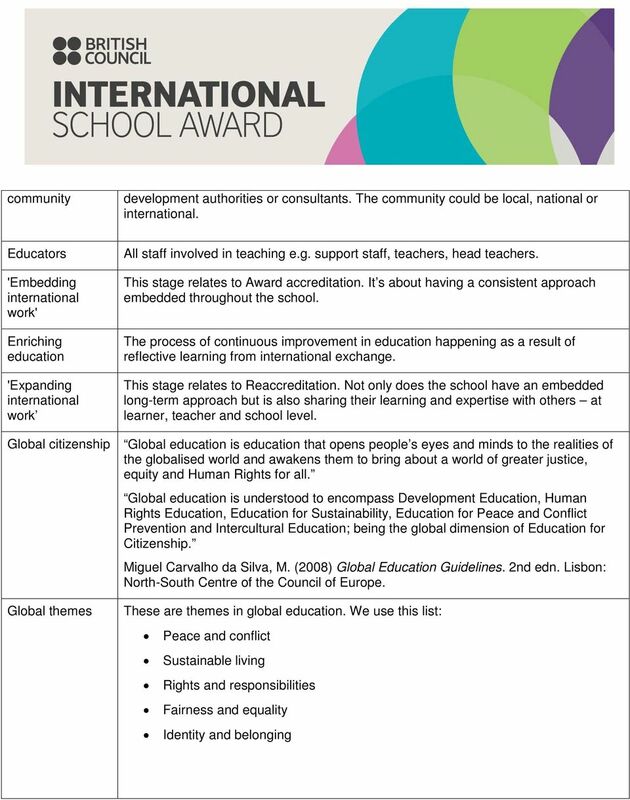 Schools applying for the International School Award must complete the following, with a focus on Global Citizenship and Enriching Education: 1. Evaluate the impact of international work on young people, educators and the school as a whole As well as building relationships with partner schools and reflecting critically on these, educators are also identifying areas for professional development and observing how the impact of collaborative projects (including language skills) can show increased engagement and achievement of young people. Professional development activities could be school-toschool activity, training workshops or individual learning. An outline of changes to your own practice and classroom management, or adaptations made to pedagogy, made as a result of collaborative partnership work, can be recorded in the Other Activities section of the Action Plan. Templates of evaluation forms for learners, teachers and parents are available on the British Council Schools Online website. We do not require evidence of the evaluation forms but they can be kept at your school to build a portfolio of evidence as you progress through the International School Award journey. 2. Revise and develop their international policy as required In order to demonstrate commitment and the support of the school management, an international policy is required for all Award levels. It should be signed by the head teacher and chair of management board, kept somewhere safe and reviewed annually. Schools at the International School Award level review international activity and assess the development of understanding in young people and educators. Educators use this information to implement useful changes to their teaching and curriculum based on collaborative learning. Please see the international policy and work survey templates available on the British Council Schools Online website. 4 3. Complete at least seven curriculum activities in one academic year which demonstrate the ISA outcomes International activities must take place throughout the year, with some activities running each term. It is not acceptable for all activities to take place during one week or in a concentrated period. 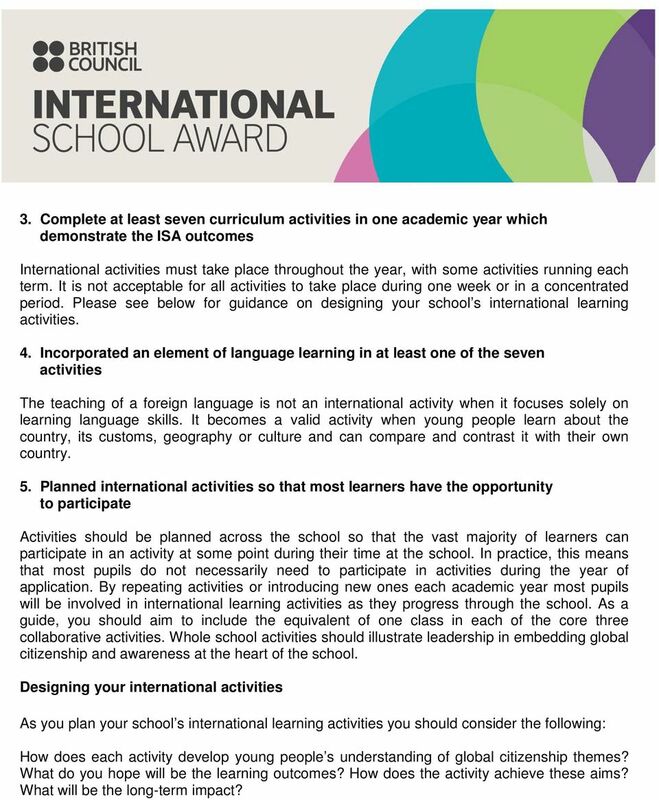 Please see below for guidance on designing your school s international learning activities. 4. Incorporated an element of language learning in at least one of the seven activities The teaching of a foreign language is not an international activity when it focuses solely on learning language skills. It becomes a valid activity when young people learn about the country, its customs, geography or culture and can compare and contrast it with their own country. 5. Planned international activities so that most learners have the opportunity to participate Activities should be planned across the school so that the vast majority of learners can participate in an activity at some point during their time at the school. In practice, this means that most pupils do not necessarily need to participate in activities during the year of application. By repeating activities or introducing new ones each academic year most pupils will be involved in international learning activities as they progress through the school. As a guide, you should aim to include the equivalent of one class in each of the core three collaborative activities. Whole school activities should illustrate leadership in embedding global citizenship and awareness at the heart of the school. Designing your international activities As you plan your school s international learning activities you should consider the following: How does each activity develop young people s understanding of global citizenship themes? What do you hope will be the learning outcomes? How does the activity achieve these aims? What will be the long-term impact? 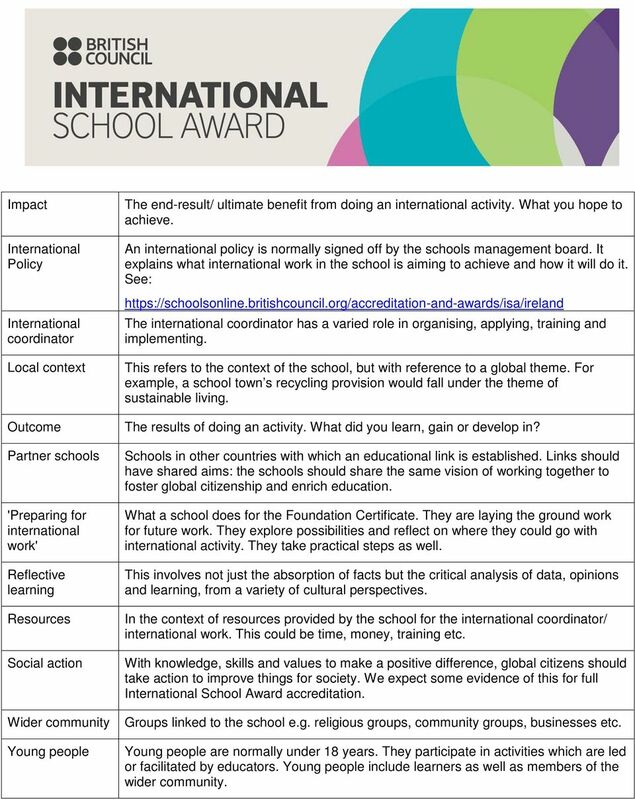 5 Evaluation of your school s international work It is important you capture the impact of each international activity. As you progress through the International School Award journey we advise that you collect and keep photos of events and examples of learners work. To support your application and to assess impact of the activity, you may find it useful to evaluate your work. Templates of evaluation forms for learners, teachers and parents are available on British Council Schools Online. How to apply All applications are made online in two stages Action Plan and Impact Evaluation. To access the application forms you will first need to register on British Council Schools Online. Stage 1 Action Plan The Action Plan describes the activities the school intends to undertake as part of its application for Award accreditation. This plan will need to be approved by an independent panel of assessors before a school can move onto stage two of the application. The Action Plan must contain a minimum of seven curriculum-based international learning activities that will take place over the course of the academic year, 2014/15. 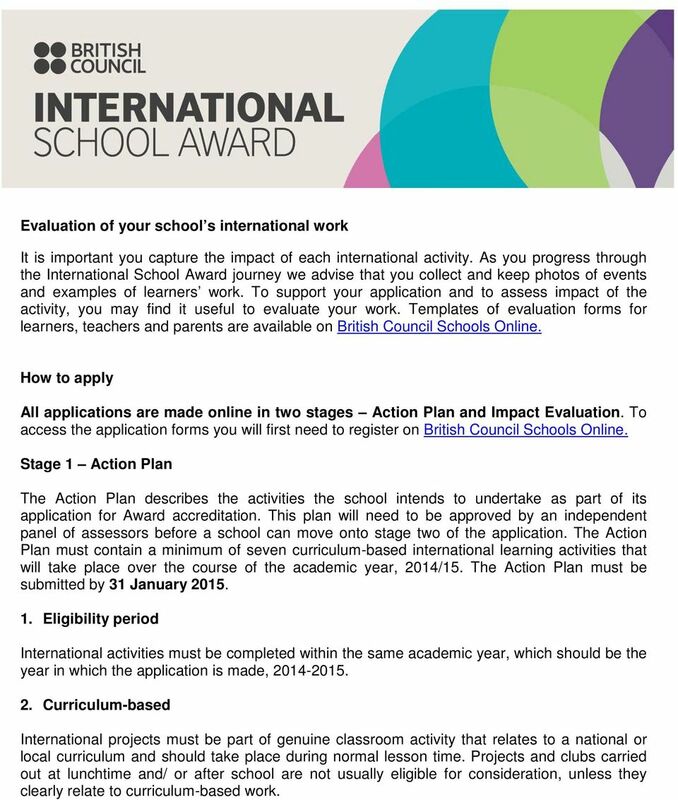 The Action Plan must be submitted by 31 January Eligibility period International activities must be completed within the same academic year, which should be the year in which the application is made, Curriculum-based International projects must be part of genuine classroom activity that relates to a national or local curriculum and should take place during normal lesson time. Projects and clubs carried out at lunchtime and/ or after school are not usually eligible for consideration, unless they clearly relate to curriculum-based work. 6 3. Focussed on international themes Every activity should have an international focus, its content must be embedded within the national or local curriculum and it should contribute to improving educational outcomes. Your activities must encourage young people to show awareness of global themes and explore the differences between their local community and that of their partner school. Examples of global themes include the following: Conflict and peace Sustainable living Rights and responsibilities Fairness and equality Identity and belonging 4. Collaboration At least three activities should be based on collaboration between learners and teachers with schools or organisations that support school education in other countries. These three activities can be completed with the same school, or with different schools from around the world. 5. Scope A broad range of subjects should be included in international activities during the year. You should endeavour to design projects that cross curriculum subjects, and involve those not traditionally associated with international learning e.g. Maths The following kinds of activity, unless supported by extensive classroom-based curriculum work, are not applicable for the Award: Fundraising and sponsoring We advise that schools move away from a donor-recipient relationship to form equitable partnerships based on trust and collaboration. Fundraising and sponsoring alone are not suitable international activities unless young people are introduced to global themes and gain a better understanding of their local area in relation to the wider world. For fundraising activities to be eligible, young people should be in regular contact with a school abroad and the content of the information exchange should have an impact on the curriculum. 7 In-country and overseas visits A trip or visit will not qualify as an activity on its own, but should be included in addition to curriculum-based projects. For example, a trip to a place of worship does not count in isolation, but as part of a term-long project on religions of the world, it should certainly be included. Ski trips and other extra-curricular visits, which have no impact on lessons, are not acceptable as curriculum-based international activities. Exchanges visits Exchange visits must show evidence of young people sharing cultural information (via , post or Skype) as part of in-depth curriculum work with their peers in the partner school, before and after the exchange visit. One day activities Assemblies and theme days can appear isolated and of low impact. Schools including them must make sure they detail the classroom-based preparation that was undertaken for the day as well as its lasting curricular impact. Stage 2 Impact Evaluation The school provides written evidence that the activities set out in the Action Plan have been completed. The evidence must illustrate the impact that the activities have had on the school, educators, young people and the local or international community, including any relevant learning outcomes. You should provide information on collaborative work and demonstrate how each activity has raised learners awareness of global citizenship themes. The impact evaluation should be submitted in the summer term, after all the activities have been completed and by no later than 31 May Please note, unlike in previous years, applicants do not need to submit portfolios of evidence for their assessment. Deadline The Action Plan forms are available on the British Council Schools Online website and can be submitted at any time before the deadline, 31 January Following approval of the Action Plan you can immediately begin working on the Impact Evaluation form which is available on the site also. The Impact Evaluation should be submitted in the summer term after all activities have been completed and by no later than 31 May 2015. 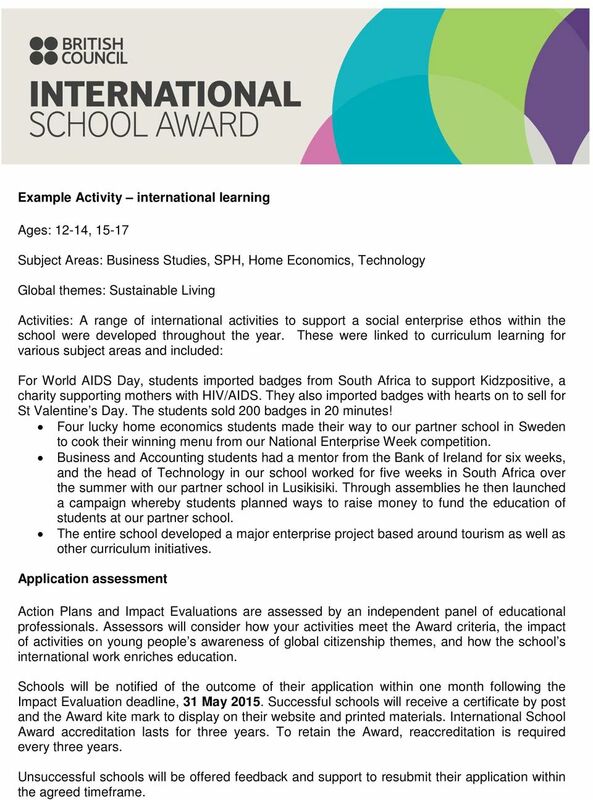 8 Example Activity international learning Ages: 12-14, Subject Areas: Business Studies, SPH, Home Economics, Technology Global themes: Sustainable Living Activities: A range of international activities to support a social enterprise ethos within the school were developed throughout the year. These were linked to curriculum learning for various subject areas and included: For World AIDS Day, students imported badges from South Africa to support Kidzpositive, a charity supporting mothers with HIV/AIDS. They also imported badges with hearts on to sell for St Valentine s Day. The students sold 200 badges in 20 minutes! Four lucky home economics students made their way to our partner school in Sweden to cook their winning menu from our National Enterprise Week competition. Business and Accounting students had a mentor from the Bank of Ireland for six weeks, and the head of Technology in our school worked for five weeks in South Africa over the summer with our partner school in Lusikisiki. Through assemblies he then launched a campaign whereby students planned ways to raise money to fund the education of students at our partner school. The entire school developed a major enterprise project based around tourism as well as other curriculum initiatives. Application assessment Action Plans and Impact Evaluations are assessed by an independent panel of educational professionals. 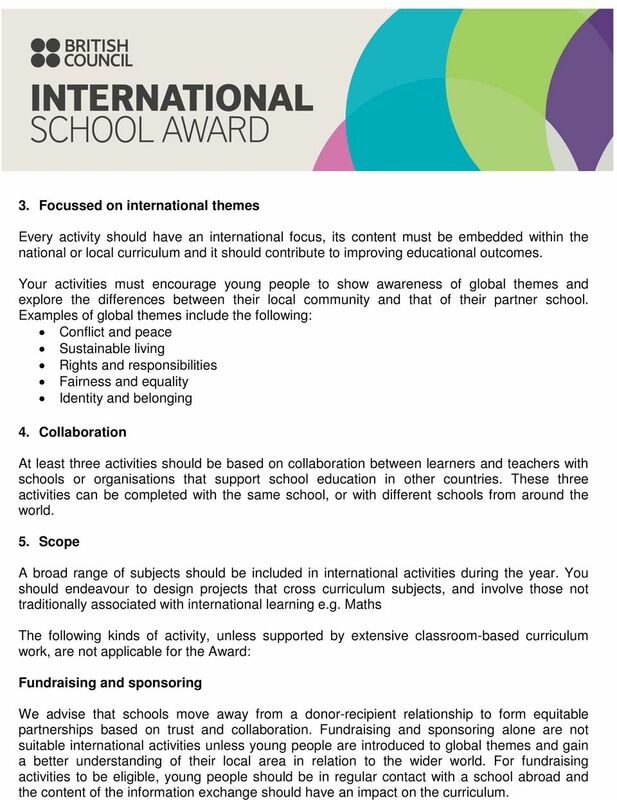 Assessors will consider how your activities meet the Award criteria, the impact of activities on young people s awareness of global citizenship themes, and how the school s international work enriches education. Schools will be notified of the outcome of their application within one month following the Impact Evaluation deadline, 31 May Successful schools will receive a certificate by post and the Award kite mark to display on their website and printed materials. International School Award accreditation lasts for three years. To retain the Award, reaccreditation is required every three years. Unsuccessful schools will be offered feedback and support to resubmit their application within the agreed timeframe. 12 Impact International Policy International coordinator Local context Outcome Partner schools 'Preparing for international work' Reflective learning Resources Social action Wider community Young people The end-result/ ultimate benefit from doing an international activity. What you hope to achieve. An international policy is normally signed off by the schools management board. It explains what international work in the school is aiming to achieve and how it will do it. See: The international coordinator has a varied role in organising, applying, training and implementing. This refers to the context of the school, but with reference to a global theme. For example, a school town s recycling provision would fall under the theme of sustainable living. The results of doing an activity. What did you learn, gain or develop in? Schools in other countries with which an educational link is established. Links should have shared aims: the schools should share the same vision of working together to foster global citizenship and enrich education. What a school does for the Foundation Certificate. They are laying the ground work for future work. They explore possibilities and reflect on where they could go with international activity. They take practical steps as well. This involves not just the absorption of facts but the critical analysis of data, opinions and learning, from a variety of cultural perspectives. In the context of resources provided by the school for the international coordinator/ international work. This could be time, money, training etc. With knowledge, skills and values to make a positive difference, global citizens should take action to improve things for society. We expect some evidence of this for full International School Award accreditation. Groups linked to the school e.g. religious groups, community groups, businesses etc. Young people are normally under 18 years. They participate in activities which are led or facilitated by educators. Young people include learners as well as members of the wider community. Lefèvre Trust & Charles de Gaulle Trust A guide to the programme Contents Page 1. Introduction to the programme 3 2. Planning partnership activity 8 3. Using the partnership progression framework 10 4. WHOLE SCHOOL THEMES. Understanding of the consequences of their behaviour and actions. HOW TO COMPLETE THE ONLINE APPLICATION FORM This simple ten-step guide should answer most of the questions you might have about how to complete the online application for a Connecting Classroom grant. Investors in People 2013 - Communications Plan. Introduction What is IiP? Gower College Swansea Leading the South /west Wales Regional Hub. Primary Schools A complete approach to transforming students enterprise skills Introduction Hello! As a team of teachers, we set up Enabling Enterprise to help our students become rounded and successful. RUSTENBURG HIGH SCHOOL FOR GIRLS RELIGION POLICY February 2009 PREAMBLE Rustenburg High School for Girls recognises the particular value of the rich and diverse religious heritage of our school community. Implications of the new art and design programme of study; planning; and taking first steps What s changed and why? FOSTERING DIALOGUE AND MUTUAL UNDERSTANDING The crucial role of young women and men in advancing intercultural dialogue and understanding is increasingly recognized within the global development agenda.